As we age, our muscles tend to become weaker and a loss of balance means we are increasingly likely to fall. 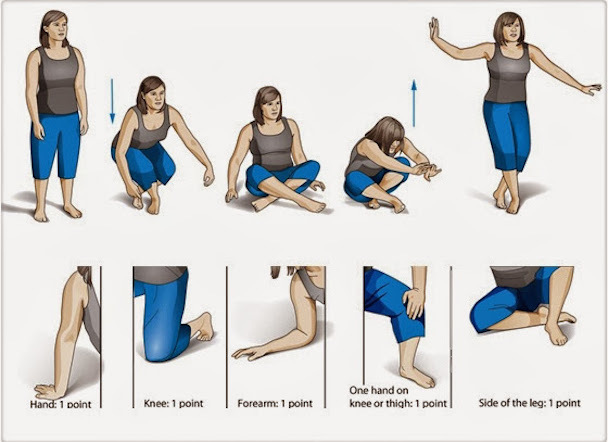 The simple exercise of sitting down and standing up again without holding onto anything, could suggest how long you have to live.This is the belief of a group of physicians, who came up with the ‘sitting-rising test’ to measure their patients’ flexibility and strength. 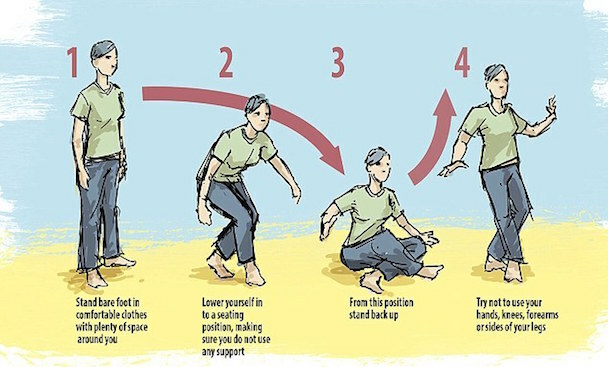 Claudio Gil Araujo, of Gama Filho University in Rio de Janeiro, Brazil, was among the doctors who originally developed the sitting rising test (SRT) to quickly assess the flexibility of athletes, but he now uses it to persuade his patients that they need to stay active to maintain their muscle and balance, and live longer, Discover Magazine reported. In a study, published in the European Journal of Cardiology, the researchers described how 2002 adults aged between 51 and 80 took the SRT at Clinimex Exercise Medicine Clinic in Rio. They found that patients who scored fewer than eight points out of 10 on the test, were twice as likely to die within the next six years, compared with people with more perfect scores. One point was deducted each time a person used their hand or knee for support to either sit down or stand up, while half a point was deducted for losing their balance. The experts found that people who scored three points or fewer, were more than five times as likely to die within the same period. The study found that every point increase in the test, was linked to a 21 per cent decrease in mortality from all causes. - Do not attempt if you have arthritis or are worried the exercise may cause you injury. - Wearing comfortable clothes and no shoes, make sure you have plenty of space around you. - Lower yourself into a cross-legged sitting position, without leaning on anything. - Stand up again without using your hands, knees or arms to push yourself up. - Get someone to score you, take the test in front of a mirror to notice any wobbles or ‘cheats’. - The first part of the test –sitting down – is scored out of five, as is the second part –standing up – making a total score of 10. - Subtract one point every time you use a hand or knee for support. - Dock half a point every time you noticeably lose balance and wobble and combine them to calculate your final score.